Greetings WP’ers! It has been a little while since we’ve posted an update, but that certainly doesn’t mean we haven’t been busy. This Sunday night (April 18th) we will update WorshipPlanning.com to version 3.9. There are a couple significant changes you will notice right away, and many other subtle changes that will simply make your experience using WP smoother. The biggest change Planners will notice is an extremely helpful menu system that makes getting to the pages you need quick and efficient. For those with the proper security settings, creating a service, series, or new Planner account is always just one click away. The other significant change we made was to the worship pages (flow, roles, etc.). Our goal for this page was to more efficiently and intuitively use the space on the page. Rather than describe the changes, take a look at the screenshot below. This shows one of the menus opened (when you hover over the Service navigation link), as well as how we’ve cleaned up one of the worship pages. 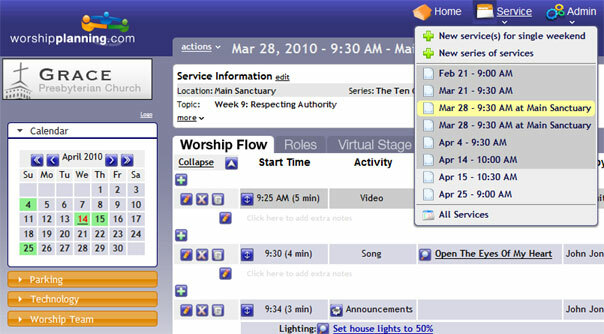 The space above the worship tabs is now more efficiently used to show the general service info. We also pushed the date/time/location of the service into the top blue banner. The left side now has the clickable calendar opened by default, and the various team panels listed below. And, by the way, if you are using Internet Explorer, many of the nice rounded corners you see in this screenshot will appear squared off. That’s simply a limitation of IE (and one of the many reasons we recommend using FireFox or Chrome). For those looking ahead, let me share with you a few things in the development cycle right now. First, we are nearly done with a feature update that will allow Planners to upload multiple files at once. We are also working on some very cool enhancements to the Songs Library page(s), which will include the ability to create “sub-libraries” of songs. This should make finding and organizing songs much easier and personalized. Finally (as in, that last one I am going to mention here), we are looking into making mobile versions of MyWP available for Android and Blackberry devices. For an update on the iPhone app we’ve developed, read on…. Most of you know we have developed and beta tested an iPhone app for WorshipPlanning.com. We had great feedback from the gracious folks that were willing to help us make the app the best it could be (for version 1.0). The app was submitted to Apple for review on March 24, and it is still officially “in review” by their app development review team. This review stage is taking longer than we expected, though it is still well within the “typical” timeframe, according to Apple. We suspect the cause for delay might be the influx of iPad apps they now have to review. As soon as we learn more about our app’s approval status, we’ll certainly pass that information along to you.